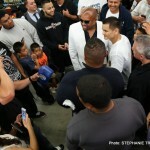 OXNARD, Calif. (April 16, 2014) – Approximately 200 fans and media that included several television camera crews, newspaper and online reporters, photographers and video bloggers turned out to watch WBA Welterweight World Champion Marcos “El Chino” Maidana during his media day on Tuesday, April 15 at The Robert Garcia Boxing Academy in Oxnard. The Argentine Maidana (35-3, 31 KOs) is winding down final preparations as he gets set for the biggest fight of his career when he faces undefeated boxing superstar, 10-time world champion and current WBC Welterweight World Champion Floyd “Money” Mayweather in the main event of “THE MOMENT” on Saturday, May 3 at the MGM Grand Garden Arena live on SHOWTIME PPV®. In fights before the Mayweather vs. Maidana 147-pound unification match on the pay-per-view telecast, British superstar and former unified super lightweight world champion Amir “King” Khan (28-3, 19 KOs) faces WBA International Welterweight Champion Luis Collazo (35-5, 18 KOs), of Brooklyn, NY in a 12-round bout for the WBC Silver Welterweight Title. Also, former three-time world champion Adrien “The Problem” Broner (27-1, 22 KOs), of Cincinnati, OH takes on Carlos Molina (17-1-1, 7 KOs), of Norwalk, Calif., in a 10-round junior welterweight bout and undefeated J’Leon Love (17-0, 10 KOs), of Dearborn Heights, Mich., meets battle-tested NABF 154-Pound Champion Marco Antonio Periban (20-1-1, 13 KOs) in a 10-round super middleweight match. With Leonard Ellerbe, CEO of Mayweather Promotions looking on, a fit and confident Maidana worked out for about 25 minutes Tuesday. After loosening up, he hit the mitts and the speed bag and smacked the heavy bag. Before and after the brief workout, he did many interviews, posed for pictures and signed autographs. “I know I am fighting the best in the world and that this is the biggest opportunity there is, so I am very thankful to Mayweather for giving me the chance. “I never let what anybody outside the ring says bother me. I’ve heard a little about what they’re saying, but it doesn’t matter. I’ve heard it before. “I’ve been an underdog my whole life. I was the underdog against Adrien Broner and Victor Ortiz and you saw what happened. I won. I am the underdog again in this fight, but I earned the right to the fight. “I will give Mayweather a much better fight than any of the other contenders will. I have trained very well, and I’m in great shape. The only pressure is to perform well. I am a fighter and I come to fight. I don’t respect any opponent when I’m in the ring. I’m in this fight to win. “This is going to be a great fight that fans will not want to miss. They know my style is to come forward. They know I like to be the aggressor. They know I throw heavy punches that can seriously hurt my opponent. .
“This is my fifth fight with Marcos and, since day one, he has come to learn and listened to everything I say. I tell him something and he does it. He’s great to work with, so willing. For a trainer, that is quite a blessing. “It’s been a great camp. 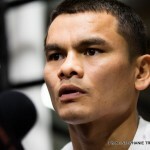 Maidana knows the odds, but odds don’t mean a thing to him. He’s coming to fight and win. He won’t be intimidated. He won’t be scared. He knows what he is capable of doing. “Mayweather is the best and has been on top for many years. He may be the best pound-for-pound boxer in history. He has done so many great things. But just because you’re the best doesn’t mean you can’t lose. Ali lost. Sugar Ray Leonard lost.